just a little before and after on textured paper...lightly draw and shade, then blend with a damp brush and watch the colors pop! click the pic to zoom in. in my local atc group, our challenge this month was to use any kind of tape on our cards - not just as an adhesive, but as a visual part of the art. click the pic to zoom in. i designed a project for this sweet compilation book that just came out this month, countdown calendars. this is the third c&t book i have contributed to - very exciting when those first copies arrive! 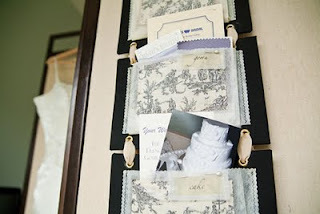 mine is a hanging set of pocket panels for a bride-to-be to stash all her clippings, cards and brochures from her planning as she counts down to her wedding day. the whole thing can be tumble-folded with the contents inside and secured with a big ribbon as a keepsake, or the pocket labels can be switched for everyday use to store photos, mail, ephemera, etc. of course it uses two of my favorite things, tap and lutradur! it's a super cute book with lots of great project patterns using fabric, paper and other materials - click here for more sneak peeks! these are the artists who did my may artist trading card swap - the theme was serenity. check the atc swap tab at the top of the blog for details on the june swap and join us! seriously? shoe forms? yes, i have a suitcase full of old wooden shoe forms, all shapes and sizes. many years ago in san francisco, i had lovely roommates named kim and nathalie who decided to move to france. we had a garage sale to help them lighten their transatlantic load, and i couldn't resist buying kim's collection of shoe forms. i don't recall exactly how or when she started to collect them, but she kept them in this round suitcase. i have been schlepping this suitcase of shoe forms around with me to my many different domains in the 15-20 years since. so fast forward to last month, when my a-muse-ing friend candace posted a creative prompt about shoes. i went out to the garage and dug out the suitcase to see what i might do with one of the shoe forms. i really like them in their natural state, and some are probably considered antiques...but i found one that was super plain and a bit marred, so i decided to paint it with black gesso (click the pic to zoom in). 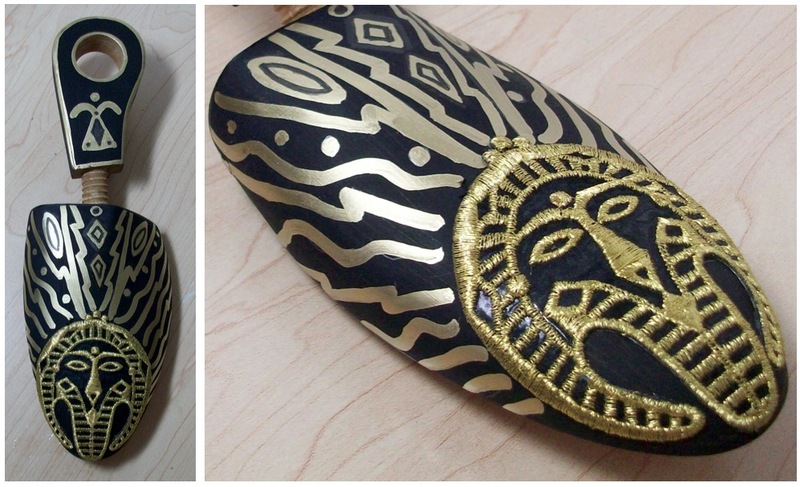 i had this cool egyptian pharoah patch (i've always been inspired by ancient masks and other cultural icons) which fit the curve of the toe perfectly, so i used a gold leafing pen to doodle some lines on it....makes me think of the bangles song, walk like an egyptian. a few weeks ago on a creative edventures webcast with a black & white theme, i shared an idea for working with two liquitex texture gel mediums - black lava and white opaque flakes. i painted the mediums with a wide, stiff brush on to 4" squares of gessoed cardboard to show how each medium looks on a black surface (right) vs a white surface (left). both squares have the white opaque flakes on the bottom, and black lava on top. my samples became covers for an atc wallet with accordion-folded pockets made from lutradur. click the pics to zoom in. I made an adjustable flat black ribbon with a buckle to wrap around it to keep it closed. click here for the instructions for making the pockets. look what my friend lisa (aka my sistah from anuthah muthah) sent me recently! she made these gorgeous little tile embellishments, i just love 'em! click the pic for a close-up. can't wait to find the perfect spot to use them! i had a lovely evening this past tuesday with my local atc group - we swapped our mosaic-themed cards, ate lots of great muchies (thanks tarri!) and had fun making inchies (thanks valerie!). here are the cards i got from my pals...so many creative materials! click the pic to zoom in. starting up at the top left, valerie combined different papers stamped with a vintagey mosaic image. in the top right, liz collaged and stamped a cool flower on adhesive foam squares. the queen in the center is eunice's whimsical design with bits of bling and lacquered paper tiles. 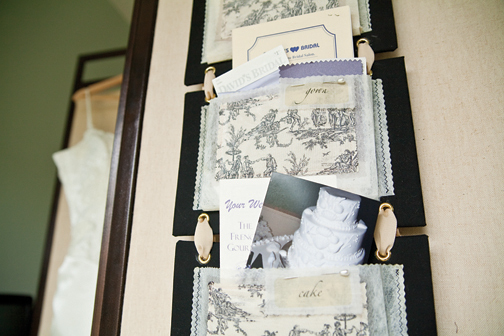 for the blue card beside her, tarri also used adhesive foam squares - can you see the sweet carousel pony? to the left, donna broke up old cds to make her mirror-finish tiles...way to upcycle! and in front, cathy made a real tile, hand-etched with a tulip, grouted and fired and everything!